Roger Clemens, Willie Robertson, Jennie Finch, Taylor Kitsch, and more to join Marcus Luttrell at PX3 Patriots Celebrity Softball National Series game. HOUSTON, TX. – Celebrities from across the country come together for the PX3 Patriots Celebrity Softball National Series Game on October 21st at Rice University in Houston, TX. 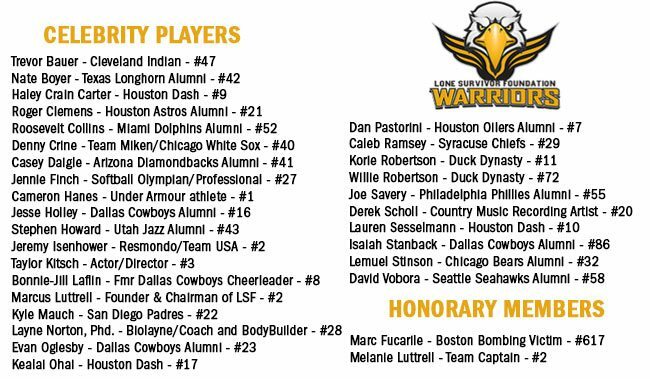 Willie and Korie Robertson from A&E’s hit TV series “Duck Dynasty” are scheduled to join the LSF Warriors, a team of celebrities, as they take on PX3 Patriots, a team of military veterans, including US Navy Seals, US Green Berets, honor recipients, amputee veterans, and wounded warriors. Willie and Korie will be joining softball Olympic medalist Jennie Finch and seven time Cy Young Award winner, baseball icon Roger Clemens. Lauren Sesselmann, professional soccer player for the Houston Dash and co-producer and host of Fitness Program ‘Fit As A Pro’ will also be playing. Taylor Kitsch, Lone Survivor actor and costar in Friday Night Lights, will also be on the field, playing alongside Mark “Oz” Geist and John “Tig” Tiegen, co-authors of 13 hours: The Inside Account of What Really Happened in Benghazi, the book that inspired the upcoming Paramount Pictures film 13 Hours: The Secret Soldiers of Benghazi. Founder and Chairman of the Lone Survivor Foundation, Marcus Luttrell, U.S. Navy SEAL (Ret.) and Navy Cross recipient, is scheduled to throw out the first pitch. The event will kick off with a homerun derby at 7:00 p.m. followed by the celebrity softball game at 7:30 p.m. General admission tickets are available for $10 and reserved field seats are available for $15-30. Tickets can be purchased online through Ticketmaster – www.ticketmaster.com. This will be the inaugural game of a national celebrity softball series hosted by the PX3 Research Foundation to raise funds and awareness of its mission and other military-focused non-profits. 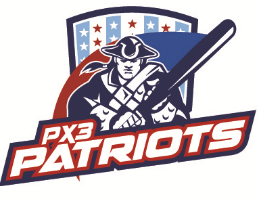 Additional event information, including the full team rosters, can be found on the PX3 Patriots webpage, www.px3patriots.org. The PX3 Research Foundation was founded by athletes and warriors with firsthand experience in traumatic brain injuries, regenerative health, and mental health. It is a trusted source for fellow athletes, warriors, coaches and parents for solution-based education, tools and research dedicated to advanced brain health and brain safety. For more information about the PX3 Research Foundation, visit www.px3foundation.org. The Lone Survivor Foundation restores, empowers, and renews hope for our wounded service members and their families through health, wellness, and therapeutic support. Transitioning to post-military life, whether wounded in combat or simply adjusting to the civilian sector, will often cause difficulty for the service member and his or her family. 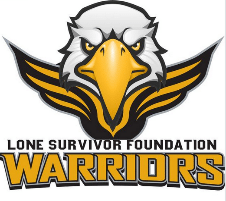 The Lone Survivor Foundation helps America’s wounded service members and their families adjust to the effects of their experiences by providing an understanding and acceptance of who they are as a person, a family, and a community. For more information about the Lone Survivor Foundation and their therapeutic retreat program visit www.lonesurvivorfoundation.org.